British Antarctic Survey‘s (BAS) DeHavilland survey aircraft, a ‘Twin Otter’, flies an instrument test from Rothera Station in West Antarctica (photo Dave Porter). A British Antarctic Survey (BAS) team is completing final preparations to fly 10 flights, collecting 40 hours and over 9000 kms of air survey mapping flights to support the large Antarctic International Thwaites Glacier Collaboration (ITGC) project. Lamont’s Dave Porter is participating to run the iMAR gravimeter. Fieldwork in Antarctica adds a whole new layer to the meaning of planning. All science fieldwork requires preparation, carefully accounting for the instrumentation, supplies and the time needed to complete the work. In addition there may be data to acquire before the field work that underpins much of the planned work. However, fieldwork in Antarctica, with the distance, remoteness and isolation, adds significant additional challenges. When large, and heavily field based projects like ITGC are planned, it is common for preliminary fieldwork to precede the larger project, to accomplish both caching supplies and collecting some backbone data. This fieldwork lays the groundwork for future fieldwork. The International Thwaites Glacier Collaboration Intensive field campaign. The ITGC combines eight multidisciplinary projects to focus on the very unstable Thwaites glacier, an area in West Antarctica approximately the size of Florida. The first year of this five-year project has involved setting the stage for the coming work, so beginning in November support field deployments have been underway by both the UK and the US. 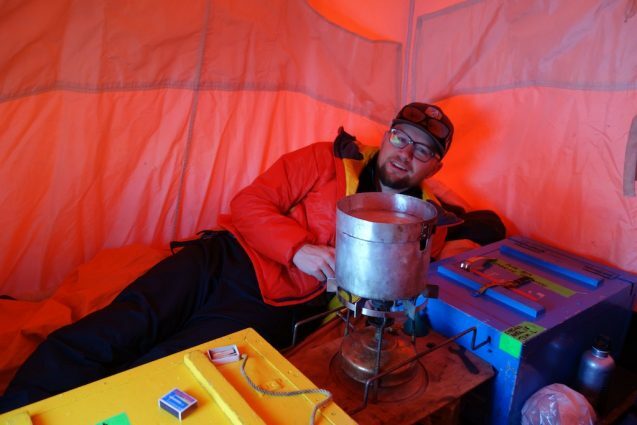 At the start of the austral summer, both British and U.S. Antarctic air and ship support began to bring in fuel and food caches for the research teams. 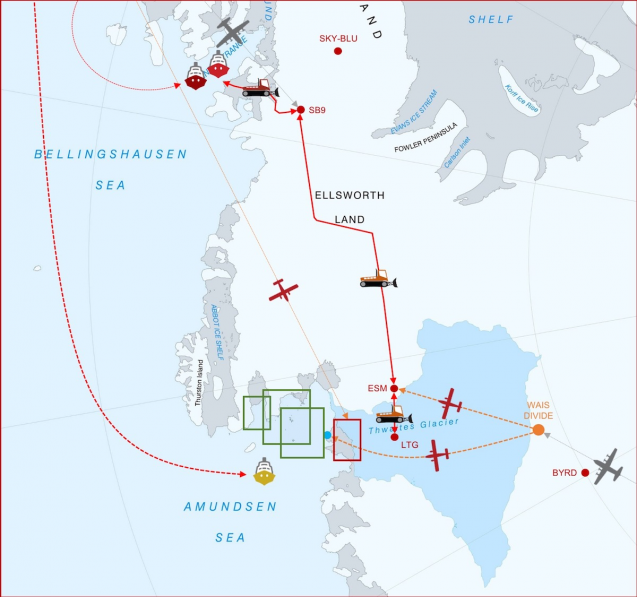 Part of the fuel drop was to support the current British Antarctic Survey (BAS) flights for science mapping to collect data on snow, ice and bedrock for the various ITGC projects. For the survey team the 5.5 hr. flight to Rothera Station of the British Antarctic Survey departed from Punta Arenas, Chile on a small Dash-7 plane. 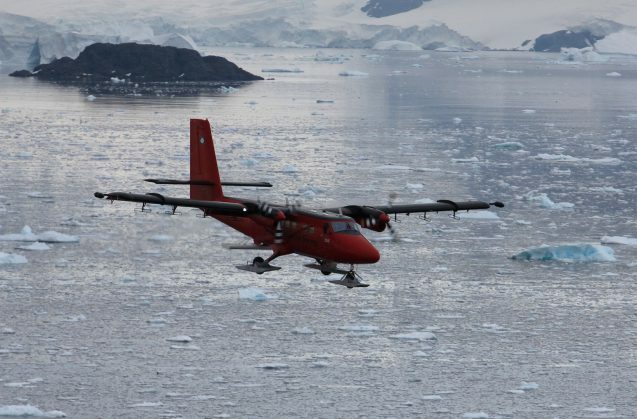 Once at Rothera the team completed field training to prepare them for their work at a remote base camp on Thwaites Glacier, before being introduced to their ‘Twin Otter’ survey aircraft, VP-FBL. 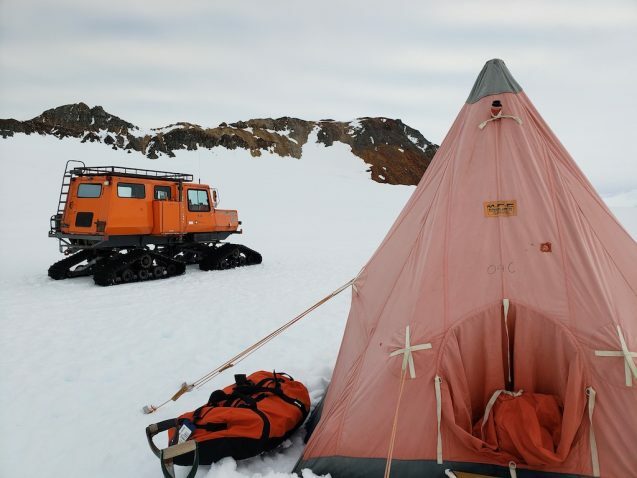 Preparing for remote field work involves rigorous training for living in the harsh Antarctic environment. ‘Field Module 2’ included a Snow Cat commute to practice winter camping on the glacier above the station (photo Dave Porter). The small airplane, ‘Bee Ell’ as the team refers to her, must be fully outfitted with PASIN2 ice penetrating radar to image internal ice layers, a Reigl scanning lidar to measure ice surface, Scintrex magnetometers on each wingtip to detect bedrock signature, a new MCoRDS surface/accumulation radar, and both a stable long wave ZLS gravimeter and new short wave iMAR strap-down gravimeter to collect data during elevation changes. Dave with his snow melting set up and his ‘Man Day Box’ which includes rations for the field stay, by all accounts not tasty cuisine (Photo Dave Porter). The overall flight plans were built collaboratively with input from the project leads to include support for the various projects. Surveys will include: the shear zone where deformation is caused by fast flowing ice meeting slower moving ice or rock and creating crevassing; areas of densification at the glacier grounding line the location where the glacier becomes and ice shelf and goes afloat; the area in front of the glacier overflying some of the Ice Bridge project lines; and several subglacial lakes (lakes found under the ice) downstream of project camps. In the belly of the plane go the camera-bay instruments, which include the MCoRDS radar for the MELT project, and the Reigl lidar. and several ‘racks’ or instruments are added inside the Twin Otter. 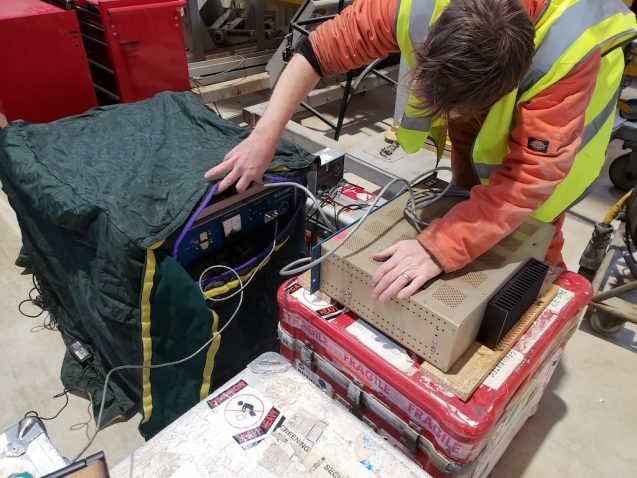 The final ground preparation involved ground testing for electromagnetic interference (EMI) before taking off with new equipment on board. Once tested on the ground Bee Ell is sent into the air and the entire ‘kit’ is tested in flight. 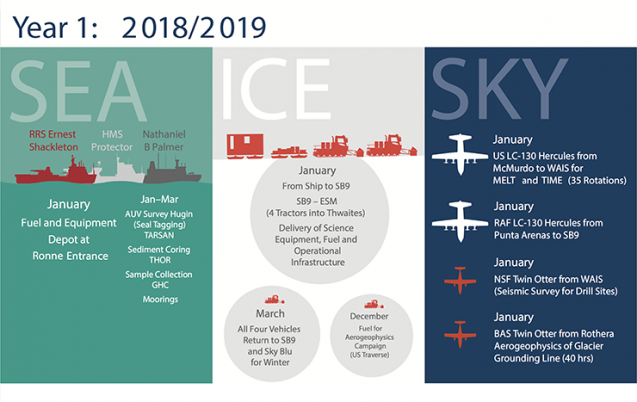 The International Thwaites Glacier Collaborative logistics plan for the multiple field campaigns that are part of the eight funded science projects. Air, ship, remote autonomous vessels and overland traverses are part of this massive logistical undertaking. For more on the International Thwaites Glacier Collaboration project.